Time for a trip through magazine lane. I feel like there should be music here-something similar to the Price Is Right. My October issue of Sunset (a magazine dedicated to the western states) came a few days ago and I mentioned that Gourmet came last week. I cherish the moment that I receive one of my favorite publications which include but are not limited to: Gourmet, Food & Wine, Saveur, Real Simple, Sunset, Dwell and am still mourning the demise of Domino. I’m hoping someone(s) that can put it back into play (i.e. has the means and power) comes along to make many of us whole again. OK, that’s a bit dramatic but you get the point. What magazines do you dig and would be heartbroken if discontinued? Here are some recipes from those magazines that I wish to try: Nutella-Swirl Pound Cake, Spicy Shrimp and Chorizo Soup and Pappardelle with Veal Ragu all from Food & Wine. Some of those were from a great article about wine pairings and I’ve mentioned before the wonderful article about Oregon wine country. Sunset also has some amazing-sounding recipes: Fennel Apple Bisque, Spinach, Leek and Potato Soup, Shot-and-a-beer Pork Stew, Lamb Shanks Adobo and Apple Oven Cake. Real Simple always has a few recipes I try: Ravioli with Apples and Walnuts, Shrimp Pot Pie with Fennel and a cheese tray for an easy, no-fuss party. I know, right. Do yourself a favor and look these up, glance (drool and dream) at the pictures and then tell me you don’t want to make a number of those dishes. I am a weekend breakfast person; breakfast during the week is coffee. Bad, I know. I tend to have an early lunch though. On the rare chance that I want breakfast during the week, this recipe is a go-to: blueberry scones. 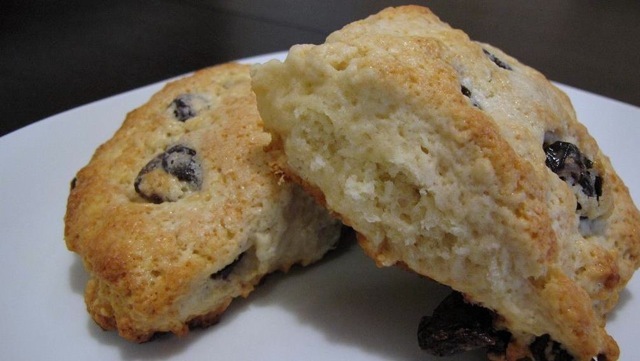 This is a Martha Stewart version that I believe is the best scone recipe I’ve come across to date. They are so easy and you can replace the blueberries with almost anything and they turn out right every time (as long as you don’t burn the bottoms as I have once). At Martha’s discretion, don’t over-knead or mix the dough because it will make for dry, tough scones. Gotcha, Big M.
Preheat oven to 400. Place a baking mat or parchment paper on a baking sheet. In a large bowl, sift flour, 3 tbsp sugar, baking powder and salt. Cut in butter (small pieces), add blueberries and zest into bowl. Whisk together cream and egg in another bowl and add to dry ingredients. Stir lightly until dough forms and place on a surface with flour to knead slightly. Pat dough into a square, enough to make 8 scones cut into 8 triangles. Place on baking sheet and brush with cream and sugar. Bake until golden for 15 to 20 minutes. Cool on wire rack and place what you aren’t eating in an airtight container once cooled.